* Virgil, Georgica 2.490. In the English translation by J. B. Greenenough: “Happy, who had the skill to undersand / Nature's hid causes.” Also quoted by Wyer Gulielmus Muys on p. 127. János Csúzi Cseh was born in Losonc around 1677, the son of the Reformed bishop Jakab Cs. Cs. (1639-1695). The troubled times forced the father to move from town to town, so János learned both in Losonc, Debrecen and Pápa. Then he went abroad: in 1699 he immatriculated at the university of Franeker, where he graduated in medicine in 1702. He became a pastor in Ács and Győr, but he also pursued medicine and even alchemy. Later he went on a three years European tour displaying a pair of Siamese twins from Szőny, by which he earned a lot. (The twins were described in foreign publications, like for example: Disputatio medica de monstro Hungarico, quam … sub praesidio Michaelis Ernesti Ettmulleri … publice ventilandam exhibet Georgius Christianus Werther. Leipzig, 1707.) It is said that his conversations with the Catholic bishop of Győr played an important role in persuading Charles III to issue the Carolina Resolutio (1731 and 1734) that considerably restricted the rights of Protestants. He died on April 28, 1732 in Győr. His works are some laudatory poems and books: Diss. inaug. med. de Rachitide, Franeker, 1702. – Isten eleiben felvitetett lelki áldozat, az-az olly áhitatos könyörgések … Győr, 1736. – In manuscript: Tragoedia podagrica, a köszvénynek rend szerint való folyásárul írt discursus, 5 kötet, 1715. 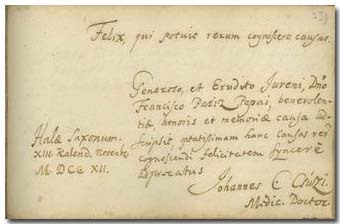 According to his note, in October of 1712 he was in Halle; he indicates his title of doctor of medicine. The rolls of the Utrecht university include two Cseh Csúzi: in 1665 Jacobus, the later bishop, father of our János, and in 1726 a certain Johannes, who, however, could not be identical to the pastor of Győr, at that time in his fifties.